I baked some Lemon Coconut Cookies some time ago that were a huge success with my family and friends. 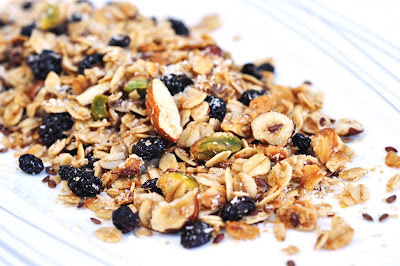 I loved the flavor combination of lemon and coconut so much that I tried it on my much loved granola. It's a match made in heaven. 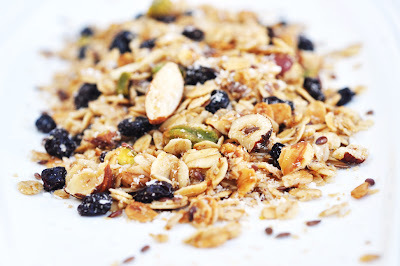 The granola turned out absolutely delicious: the invigorating flavor of lemon and the mild and smooth coconut are just about what you need for breakfast to have a great start of the day. I combine it with fresh chopped fruit and a big dollop of yogurt and find it highly addictive. Try it yourself! In a pan, combine coconut oil, honey, lemon peel and lemon juice. Bring to boil. Take off the heat when the honey is dissolved. Let cool a little. In another bowl, combine oats, flax seeds and chopped nuts. Mix well. Pour the honey mixture over the dry ingredients and stir until the oat mixture is well coated. Spread the granola evenly on a baking pan, and bake for 20 minutes. Turn over the granola, and stir in the coconut flakes. Bake for another 10 minutes. Let cool and stir in the currants. Keep in airtight container.